HayThere hay feeders from RPM Rural Products help take a lot of the pain out of the back-breaking chore of lugging and placing hay around the farm. They work in one easy and convenient step. 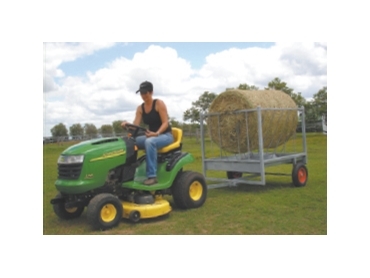 The operator just needs to load the hay bale in the HayThere cart and connect it to a ride-on lawn mower or tractor. Then it can be taken anywhere around the property. HayThere hay feeders also provide a clean and tidy way for livestock to eat hay. And the hay bale and its remnants fall into the tray at the bottom of the cart and stay clean and dry. In other words, mess and wasted hay are minimised. And once the hay is consumed, the operator can simply load the hay feeder again and drive it to any new location.